May 27, 2005 — Here they are! As you can see, they are little booklets about the size of a passport. We got to the Instituto Nacional de Migracion in Queretaro just after nine this morning, having come in from our town of Bernal, about an hour’s bus ride away, with a 15-minute taxi ride from the bus station. We waited about an hour before it was our turn, and then we gave the woman helping us the temporary papers we had. She went upstairs. We waited, standing at the counter. After a while I said to Kelly, “Maybe they are doing them right now.” Kelly burst out laughing and agreed. Or maybe they were looking for them… with all the folders that are everywhere, they must misplace some now and then. If you’ve been reading my blogs about the FM-3 process we have gone through, you know that it’s taken patience on our part as well. But repeatedly we have received great kindness from the people at the counter in explaining things to us over and over and in helping us figure out what to do. So we had our Mexican FM-3 visas, giving us residency in Mexico and the freedom to come and go at the border. What a thrill! We took a taxi across town and I told the cab driver that we had just gotten our visas to live there. He congratulated us and welcomed us warmly to Mexico. Mexicans are generally quite pleased that we like living here. Our next stop was the fancy mall I showed photos of recently. We went to the Lloyd’s office and opened an account there. Then we had lunch and took another taxi back to the bus station. It was cool and overcast today, looking like rain. We had a short wait for the bus to Bernal. I’ve mentioned before that the bus stations resemble airports in the U.S… here’s a picture in the local bus section. The waiting areas for long-distance buses are cushier. When the clerks at the counters aren’t busy helping customers they call out the names of cities that they serve. So now we are wrapping up details at home and packing up. We left some money for the electricity and water bills, and for cat food, with our landlord and friend Francisco. He thought we’d left more than we needed to, and then told us a Mexican saying that I may have written down correctly: “Mas vale que sobre y no que falte.” So it’s better that we leave too much than too little. That reminded me of another saying he had told me once before, and I asked him to say it again. “Quien es mas rico? El que mas tiene o el que menos ncesita?” which translates as “Who is richer? He who has more or he who needs less?” Kelly and I like this one a lot, as we have done so many things in our lives because we generally need less. Congratulations on your FM3 visas and resident status. You feel so at home when you don’t have to stop at the border. 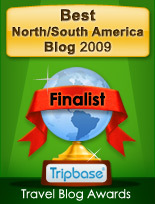 I have followed you blogs since day one on your Mexican adventure. After years of travel and living in Mexico, I see that you have found that there is a better way of life. To live simple with people who know how to make you fell a part of them, is one of the greatest feelings one can have. Hope to see you return to your second/new home very soon. Now travel and see the rest of this wonderful country. Thanks, both of you! It’s an odd combination, to receive these visas that allow us to stay here AND that’s what is prompting our packing up and housecleaning to leave! Anonymous, it’s comments like yours that keep me blogging. I’ve “met” some of my readers via email but I know there are lots more out there. Thanks for your welcome. “broker” and simply sat back and waited. One trip to get photos taken and one for fingerprinting. Wilma told us what proof of income and residency information we needed and handled all of the photocopying and running back and forth to immigration and to the bank. In three weeks we had our FM-3. We will need to renew this coming February and will hire Wilma to do it for us again. We figure everything else is so cheap in Mexico, why go through the hassle to save a few Peso’s. This broker sounds like the way to go! I didn’t know about such people when we got started. Congratulations on your residency papers for Mexico lindo! I read the whole blog & have 3 pages of notes :) but I may not have your patience so will look for a docu/paperwork broker when in Veracruz. Would this be “corredor de documentos” in Spanish? I’ll find it, no problemo. I read that it could be easier to get the FM-3 while still in your home country and was thinking of looking into it before leaving to live in Veracruz. But I’m not absolutely ready to get residency & wasn’t sure what to do. I may use my 6-month tourist permission to decide. Cheers and mucha suerte! Lou, I think it is often easier to get started with the FM-3 in the US and perhaps in other countries, but I think (not sure) that in that case, you still have to go to la Migra once you get settled. If you aren’t sure, I’d say stick with your plan of going in on a tourist visa. Bajamalibu, try doing searches on google and yahoo for fm3 and “los angeles” or fm3 and rosarito, also using the word broker or lawyer or some such word if needed. Local search is getting much better online! I’ve been living and working here for over six years, married a Mexican here and have had two children here. I’m glad to see there are people who still have a tolerance for the bureaucracy. I can’t wait to get my wife’s K-3 so we can get out of here and back to the US where we belong. Bluspaghetti, good luck wherever you end up. There are certainly times when the Mexican bureaucracy drives me nuts but that happened in the US too.